Scientific Machine & Welding, Inc. is a stainless steel cleanroom fabrication specialist providing great value to our customers. Create any stainless steel cleanroom fabrication, equipment or custom cleanroom furniture for your cleanroom, or customize any standard product for your exact requirements. We'll help you design just what you need, and build it for you with the highest quality electropolished or brushed stainless steel. 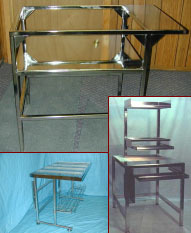 Each item is precision crafted to your exact specs, from unique tables and benches to custom ladders, carts and more. 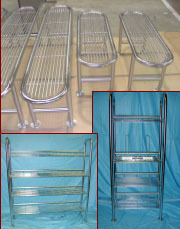 We can even help design, create and deliver custom stainless steel fabrications & custom cleanroom furniture for your existing or new cleanroom!